Designed primarily for use with reptile racking systems, the Slim-Strip™ Heat Mats are the ideal choice for reptile breeders. 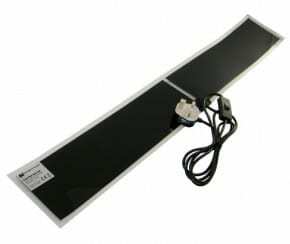 Complete with adhesive back and individual switches, these heat strips are ideal for use on multi-level systems. As many keepers in the UK use the ‘Really Useful Boxes’ for their housing, the Slim-Strip™ heat mats have been designed with the perfect measurements in mind. The 20W strip is ideally suited for the 33L and 50L RUB’s fitting 2 across with a spacer; whilst the 26W strip is ideally suited for 6L, 9L and 12L RUB’s fitting 4 across with spacers.